Whirlpool's high-efficiency top-loading washing machine line-up is topped by the Vantage series (WTW7990XG). 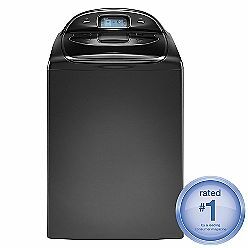 This is Whirlpool's flagship top-loader, and as such sports some of the most premium features among the manufacturer's line (as well as across the industry). First, the appearance is nothing short of luxury. A deep dark gunmetal color called "Cosmetallic" is accented by chromed touchpoints (buttons, lid border). The contours of the lid are much sleeker than those of any other top-loader. A smoky dark glass window gives a view inside while maintaining the shiny darkness of the exterior. There are only three parts of the controls: a chrome touch-sensitive power button, a chrome touch-sensitive START/PAUSE button, and the touchscreen control panel. The backsplash is sleekly rounded and continues the chrome border of the lid from one side to the other. The Vantage is built on the Cabrio chassis, and as such maintains the same general physical layout. The washbasket, washplate, motor, and all core components are the same. However, there are some small perks that have been added, like LED lighting for the interior, so finding that last sock is that much easier (and it looks really cool when you open it up!). Another change from the traditional Cabrio line is the addition of a USB port. You might be asking yourself, "why does my washer need a USB port?" Good question. 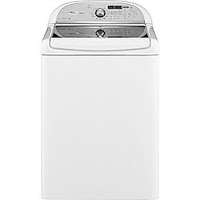 Mainly, it's so that if Whirlpool updates the firmware to add or improve wash cycles, or fix bugs that might exist, or in any other way improve the washer's performance based on the firmware, you can add it yourself with a thumbdrive and a computer. The traditional methods of doing this involve one of two things: purchasing a new control panel (at an expense of about $200) and getting it installed ($100-200, depending), or purchasing a new washing machine. It's pretty cool that these updates will be customer-driven rather than technician-driven. And, Whirlpool may be expanding this capability to other washers and appliances as time goes on, as well as possibly giving the machine a direct link to the Web for updating firmware. At 4.0 cubic feet (DOE), the washbasket has enough capacity to handle up to three laundry baskets of clothes (according to Whirlpool's advertising copy). Basically, it's a REALLY BIG TUB. Big enough to easily accommodate a king-size comforter. Or, a full set of king-size sheets and the shams. And another set of king-size sheets and the shams. This will let you cut your weekly loads by 25-75% in most cases, so you'll have more time to do things you actually want to do! As with most HE top-loaders, there are various cycles and options within the cycles. But, because it's all done via touchscreen, they're able to pack in more options without creating a confusing array of buttons and knobs. Select the cycle, select the options (if you want to), and hit the START button. You'll be amazed at how much you can customize the wash cycles. Of course, there are restrictions. It will protect your laundry by not allowing hot water to be used on delicates, and other goof-proof limits are in place. And, if you're really worried about someone who might not be so good at doing laundry, there is the option to create a custom cycle for that person. That way, they just select the custom cycle and hit START. Pretty slick! Now, we all know that kids (and adults, at times) have a tendency to let the lid slam shut. Not a problem! The Vantage has a soft-close lid, so it will gently lower the lid until it's closed. No more banging and slamming. And, the lid OPENS on its own, too. So, no more whipping the door open. Very quiet, very smooth, very cool. With the direct drive motor and high spin speeds, as well as the counterbalance system, the wash and spin cycles are extremely quiet. The "chunga chunga" noise of the old agitator machine is a thing of the past, and it's replaced with a much quieter whirring sound. Install them near a nursery or a bedroom if need be. They will be quiet enough that they will not be a bother while running. The eco-monitor allows you to see how efficient a cycle you're using. Not only does it base its ratings on the temperature of the water used (hotter water = more energy) and the amount of water used (extra rinse, for example), but also the spin speed, as higher spin speeds extract more water, resulting in lower energy use in the dryer. With a maximum spin speed of 1,100 RPM, it's able to pull plenty of water out of your laundry. This is a great way for you to see how the Vantage is working to cut your utility costs and preserve resources. As with all high-efficiency washing machines, HE detergent is required. The Vantage has a "Clean Washer with Affresh" cycle for basic maintenance. As I've noted elsewhere, regular use of oxy products like Oxi-Clean with hot cycles will maintain washing machine freshness and cleanliness without having to spend extra money on special products to keep your washer happy. Use the Vantage's Sanitary cycle to wash your towels and throw in some Oxi-Clean (or your favorite brand) along with your usual detergent. Your towels will come out cleaner and sanitized, and your washing machine will be clean and fresh. If you're looking for the peak of laundry performance, the apex of appliances, the king of the hill, the Whirlpool Vantage is it. The next step down is the Whirlpool Cabrio 7800. It drops the sanitary cycle, the interior LED lighting, touchscreen controls, auto open/close lid, the sound insulation isn't as strong as the Vantage's, and it returns to the more traditional Cabrio appearance. It is still an excellent machine with a more modest price.